Earlier this week, I posted C's 3.5 year update and I mentioned that he loves all things creative so I really try to encourage that streak. 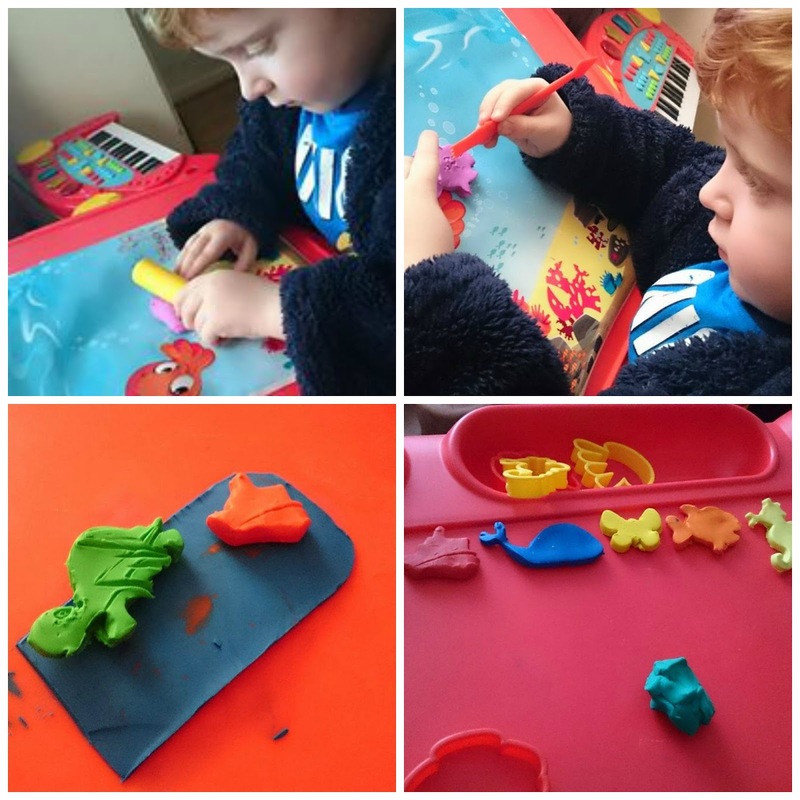 He loves building and making things so I knew the Plasticine Softeez range would be a hit. I remember playing with Plasticine when I was younger and it being really hard and tough. The Softeez range is, as you can imagine by the name, a bit softer. It does feel hard in the block but once you've rolled it around in your hands for a bit it softens up. 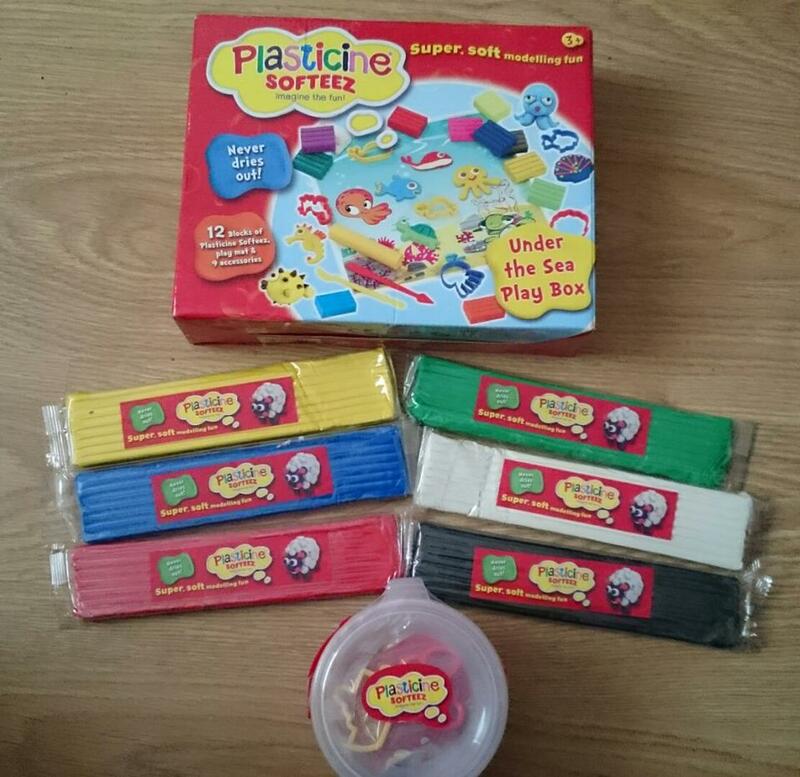 We received six 150g slabs of different coloured Plasticine (RRP £1.29 each), a Tub of Fun (RRP £4.99) containing two cutters & five small bars of Plasticine and the Under the Sea Play Box which comes with a plastic background image (great for putting down on the table so residue isn't left), 12 small bars of Plasticine and nine accessories such as rollers and cutters. C has played with different types of softer dough before but never Plasticine. He had the best time making his under the sea image and loved telling me what all the different cutters were. I did have to help him roll it sometimes as it's a little harder than what he's used to. Drawing eyes and shapes with the tools provided is something completely new to him and he had to give every creature eyes. C tended to mostly flatten the Plasticine and use the cutters but because of the toughness, it's easy to mould it into 3D shapes too. The Plasticine Softeez really brought back memories for me and I think I had just as much fun playing with it as he did. The only things I wasn't a fan of were the fact that once it's rolled it really sticks to whatever you've put it on which is why I was pleased that the Under the Sea set came with a background mat. I did have to use one of the tools to prise the shape up without ruining it. It doesn't leave a residue on your hands which is something that I'm not used to. It's not a big deal, hands are easily washed - I just don't like having my hands dirty! All in all, I am really impressed with the Plasticine Softeez range and I think they are really well-priced. The cutters and accessories are made of hard, smooth plastic with no sharp bits so I had no problem with letting C use them on their own. The big selling point for me is that they never dry out. C tends to leave dough out of the tub which destorys them so this, I think, makes Plasticine Softeez a cut above the rest. As well as the Under the Sea Play Box you can also buy a Cupcake Creations set. Each of these retail at £9.99 and are recommended for children aged 3-5 years. You can find out more at the Flair website and you can keep up to date on Facebook, Instagram and Twitter.